Prof. Bala is currently a Professor at the Center for Atmospheric and Oceanic Sciences, Indian Institute of Science, Bangalore. He got his Ph.D in atmospheric and oceanic sciences in 1994 from McGill University, Canada. After two years of Post-doc at the Geophysical Fluid Dynamics Laboratory, Princeton University, he served as a “Physicist” (Climate Scientist) at the Lawrence Livermore National Laboratory (LLNL) between 1996 and 2008. While at LLNL, Prof. Bala developed and used earth system models to understand the causes and effects of climate change. 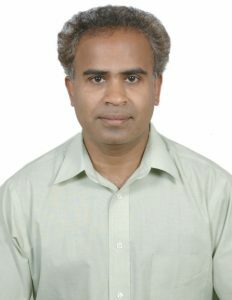 Prof. Bala’s main research interests are modelling of climate change, carbon cycle, land cover change and geoengineering. He has published over 100 research papers on climate change and carbon cycle. Prof. Bala is the recipient of the 2008 Scopus young scientist award for Earth Sciences. He and his collaborators Prof. Long Cao of China and Prof. Ken Caldeira of USA won the prestigious World Meteorological Organization’s (WMO) Norbert Gerbier MUMM International Award for 2014 for their research paper in ERL (Environmental Research Letters). Prof. Bala has served as a Lead Author for the carbon cycle chapter and as a contributing author for the clouds and aerosols chapter for the 5th assessment IPCC report. He serves as editor for the journals “Earth System Dynamics” and “Environmental Research Letters Reviews”. He is a member of the SSC (Scientific Steering Committee) of the AIMES (Analysis, Integration and Modeling of the Earth System) a global research project of “Future Earth”. He is also the National Coordinator for the “Environmental Science and Climate Change” theme of IMPRINT, a flagship program of the Ministry of Human Resource Development, Government of India.